At NPH, caregivers are the first people children develop a close relationship with. They help the children feel safe, and therefore the child knows that someone cares for them. 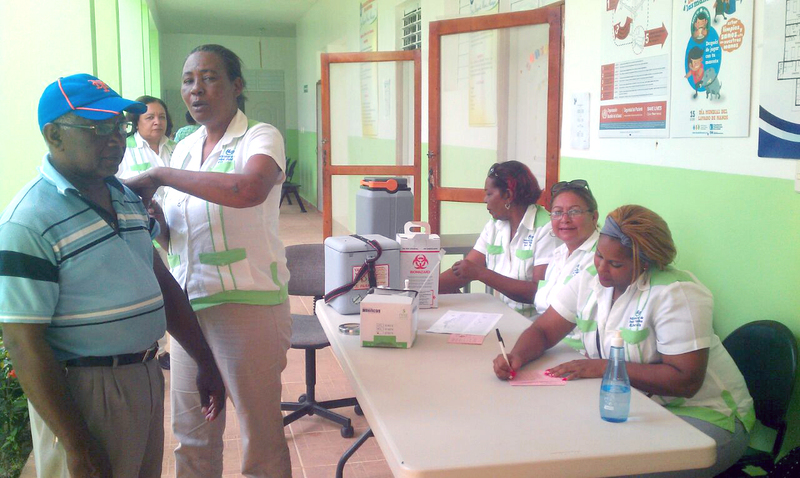 The clinic in the Dominican Republic home began two years ago to do an annual check-up for al their staff; starting with a physical exam with special emphasis on blood pressure, blood sugar levels, cytology (in women) immunization and health education. To have healthy caregivers is quite important given the amount of energy and attention to the detail they need to care for the children. The clinic staff works with them on teaching them how to prevent adulthood diseases, especially, the ones that can lead to chronic conditions and easily preventable such as hypertension, cardiac problems, diabetes, obesity or cervical cancer. All of these are very prevalent in developing countries. Mental health wellbeing is also a part of the program in order to prevent excess of stress, and burnout that can lead to major problem for the caregivers. Employees working in agriculture, kitchen or bakery, should be vaccinated against Tetanus, Hepatitis A and Salmonella. Through health education they are also more prepared to advice and talk to the children or even identify early warning signs in children. It is a fact than mothers, or in this case caregivers, who are educated on health basics better care for their children, children are less sick, and happier. This “pilot “program is really significant and hopefully can be extend to other countries where NPH works. Caring for them can be, also, a reason to improve employee retention and in the end provide sustainability and quality outcome.